Birding in Zambia, like other countries, is heavily influenced by its geography. Zambia is land-locked so does not have a marine influence. Most of the country is on a plateau with elevation from 900-1250 m (3000-4100 ft). The elevation gradually decreases to the southwest, and a small area in the far northeast reaches 2000 m (6600 ft) and can be considered montane. The highlands consist of the Nyika Plateau and the Mafinga and Makutu Mountains, which represent the southern-most extent of the "Eastern Arc" of mountains present in neighboring Tanzania and Malawi. 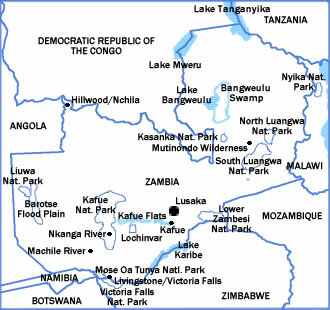 Several ancient troughs, extensions of the Rift Valley of East Africa, lie below 900 m. The most notable of these are the Luangwa Valley, the Middle Zambezi Valley, and the areas around Lake Mweru and Lake Tanganyika. The major river system is the Zambezi, which flows from the Congo to the Indian Ocean and forms the western and southern border of the country. Major tributaries include the Kafue and Luanwa Rivers. The Zambezi drainage covers 70% of the country, with the remainder lying within the Congo catchment basin. Despite its size, Zambia has a quite uniform vegetation mosaic that consists predominately of Miombo Woodland, Mopane Woodland, and grassy dambos. In addition, there are a variety of wetlands as well as riverine habitats along the major rivers. Below is a general breakdown of the major birding habitats. When one flies over Zambia, one is struck by the sameness of the woodland below. This is the Miombo Woodland, which covers 50% of the country predominantly in the north. The woodland is interspersed with grassy wetlands, or dambos, around the headwaters and along the margins of major rivers. These dambos make up about 30% of the Miombo biome and are most extensive in the north. Many parts of the region have suffered extensive deforestation due to charcoal production and clearing of the land for farming. Kafue National Park protects an extensive tract of this habitat biome. The upper slopes of South Luangwa National Park are also covered by Miombo Woodland. Birds of undisturbed woodland often form mixed species flocks. A single flock may contain 10-20 different species of mainly insectivorous birds. The most conspicuous are Fork-tailed Drongo and White-fronted Black-Chat. Miombo Woodland on rockier ground is scattered throughout the Miombo biome and is home to some fairly locally distributed species. These include Shelley's Francolin, Freckled Nightjar, Rock-loving Cisticola, Boulder Chat, Familiar Chat, Striped Pipit, and Cape Bunting. Mopane trees grow in hotter, drier regions so Mopane Woodland replaces the southern extent of Miombo Woodland. They cover about 15% of the country and cover valleys in the south. Mopane Woodland predominates in the valleys of South Luangwa National Park, areas north and south of Kafue Flats, along the Zambezi River, and in Lower Zambesi National Park. Zambia's only endemic, Black-cheeked Lovebird, is found in Mopane Woodland. Other notable species of this biome are Southern Red-billed Hornbill, Meve's Glossy-Starling, Southern Gray-headed Sparrow, and White-browed Sparrow-Weaver. Light woodland is present along the edges of plains or rivers and in some cases are a result of human activity. It is present throughout the country in different forms. A number of birds not found in undisturbed more dense woodlands are found in this habitat. These include Black-shouldered Kite, Black-bellied Bustard, Namaqua Dove, Bare-faced Go-away-bird, Gray Go-away-bird, Little Bee-eater, Lilac-breasted Roller, Flappet Lark, Fawn-colored Lark, and Yellow-fronted Canary. True forest covers only a small part of Zambia. The forests are varied and include Baikiaea Forests in the southwest where Zambia Teak predominates, riparian forest along river banks, wet evergreen forest on moist ground on higher plateaus around major rivers, dry evergreen forest in the north, and montane forest in the far northeast. Many bird species are restricted to these forest habitats. Typical birds found in riparian forests include Pel's Fishing-Owl, Half-collared Kingfisher, Giant Kingfisher, Olive Woodpecker, Black-throated Wattle-eye, Cassin's Flycatcher, and Spectacled Weaver. Wet evergreen forests or mishutu is located mainly in the plateau regions between Lake Mweru and Lake Tanganyika. Some of the birds of this habitat are Woolly-necked Stork, Lemon Dove, Yellow-rumped Tinkerbird, Boulton's Batis, Many-colored Bushshrike, Square-tailed Drongo, African Crested-Flycatcher, Yellow-throated Greenbul, Little Greenbul, Cabanis's Greenbul, Laura's Wood-Warbler, Gray Apalis, African Tailorbird, Bocage's Akalat, African Thrush, Splendid Glossy-Starling, Western Olive Sunbird, Green-backed Twinspot, Black-bellied Seedcracker. Dry evergreen forest, when well established, supports many of the same species. In the northwest this forest is also home to Gorgeous Bushshrike. There is very little true montane forest in Zambia. Nevertheless, this forest is home to many species including Rufous-chested Sparrowhawk, Rameron Pigeon, Dusky Turtle-Dove, Abyssinian Nightjar, Montane Nightjar, Scarce Swift, Bar-tailed Trogon, Silvery-cheeked Hornbill, Moustached Tinkerbird, Cape Batis, Fuelleborn's Boubou, Eastern Mountain-Greenbul, Yellow-streaked Greenbul, Chestnut-throated Apalis, African Hill Babbler, Olive-flanked Robin-Chat, White-starred Robin, White-chested Alethe, Sharpe's Akalat, Little Slaty Flycatcher, Redwinged Starling, Slender-billed Starling, Chestnut-winged Starling, Waller's Starling, Eastern Double-collared Sunbird, Red-faced Crimson-wing. At the edge of higher elevation montane forest, Striped Flufftail, Mountain Yellow Warbler, Cinnamon Bracken-Warbler, Black-lored Cisticola, Churring Cisticola, Cape Robin-Chat, African Citril, Streaky Seedeater, Bertram's Weaver, Baglafecht Weaver, and Swee Waxbill. Dry montane grasslands at higher elevations are home to Red-winged Francolin andCommon Quail. At lower elevation the driest areas form extensive grassland, home to Temminck's Courser, Red-capped Lark, and Desert Cisticola. The relatively flat plateaus of northern Zambia have poor drainage, so during wet season the water seeps through many of the grasslands to form wet spongy grasslands or marshy areas before eventually into lower spots to form rivers. These wet grasslands or dambos are home to many birds. The species vary depending on drainage. Permanently spongy short grass areas are home to species such as Blue Quail, Streaky-breasted Flufftail, Black-and-rufous Swallow, Stout Cisticola, Croaking Cisticola, Pectoral-patch Cisticola, Yellow-throated Longclaw, Fuelleborn's Longclaw, Grimwood's Longclaw, Red-billed Quelea, Yellow-shouldered Widowbird, Marsh Widowbird, Buff-shouldered Widowbird, Fawn-breasted Waxbill, Red-billed Quailfinch, And Locustfinch. The centers of dambos form reedbeds and reed-fringed marshes where one can find African Rail, Lesser Jacana, African Jacana, Lesser Swamp Warbler, Little Rush-Warbler, Chirping Cisticola, Bocage's Weaver, and Black-headed Weaver. Zambia has several huge wetlands on the plateau areas around major rivers. Among these are the Bangweulu Swamp, Barotse Floodplain, Kafue Flats including Lochinvar and Blue Lagoon, Busanga Swamp, and Lake Kariba on the Zambezi River below Kariba Gorge. Many of these wetlands are surrounded on the periphery by floodplains. The best place to see the Shoebill is during dry season at Bangweulu Swamp. Shallow, inundated vegetation is home to species such as Comb Duck, Spur-winged Goose, Yellow-billed Duck, Red-billed Duck, Hottentot Teal, Saddle-billed Stork, Rufous-bellied Heron, Sacred Ibis, Gray Crowned-Crane, Long-toed Lapwing, African Snipe, Greater Painted-Snipe, Malachite Kingfisher, and Sedge Warbler. Shallow open water supports a variety of herons, egrets, terns, African Openbill, African Spoonbill, and Pied Kingfisher. Extensive papyrus swamps in the north are home to Papyrus Yellow Warbler, Greater Swamp Warbler, and Swamp Flycatcher. A number of birds are predominantly found in villages, around bridges, or in suburban gardens. Mosque Swallows and Gray-headed Sparrows nest around buildings. White-rumped Swift, Wire-tailed Swallow, Red-rumped Swallow, Lesser Striped-Swallow, and Red-throated Swallow commonly nest under bridges and some are expanding their range as a result. Many migrants appear in suburban areas including gardens, as do a variety of sunbirds, finches, and whydahs. Commercial farms attract storks, raptors, doves, and various other open country species. Zambia is in a subtropical region of Africa but still has 3 main seasons due to it's land-locked location and its elevation. The seasons in turn govern when birding is at its best. The seasons are dry season from May-August, hot season from September to mid-November, and wet season from mid-November-April. Dry season is the coolest season when day-time temperatures are around 72-82 degrees F, while day-time temperatures during hot season are around 101-108 degrees F. Temperatures during the wet season are usually in the low 90's. Time to visit depends on one's goals. The best time for birding is wet season because that's when birds are breeding. There is also a diversity of Palearctic migrants that are absent at other times of year. However, logistics become more difficult, some roads become impassible, and some reserves are closed. South Luangwa National Park has only limited access and the Nanzhila Plains Safari Camp in south Kafue is closed from mid-November to April. If seeing African Pitta is a priority, then one must visit during December-January. If seeing Shoebills is a priority, the best time is dry season when the Bangweulu Wetlands is accessible. Game viewing is best during dry season from June-early November because grass is short and the animals are easiest to see. Peak time is the driest time during October-November when game animals congregate around waterholes. The worst time for game viewing is the wet season when grass is tall and animals are harder to see. The best viewing of Victoria Falls is April-May when the cataract is truly thunderous and water levels are highest. At this time the spray can be so intense that the falls may become difficult to actually see. The flow becomes progressively less as dry season progresses, so the worst time for viewing the falls is peak dry season during October-early November.